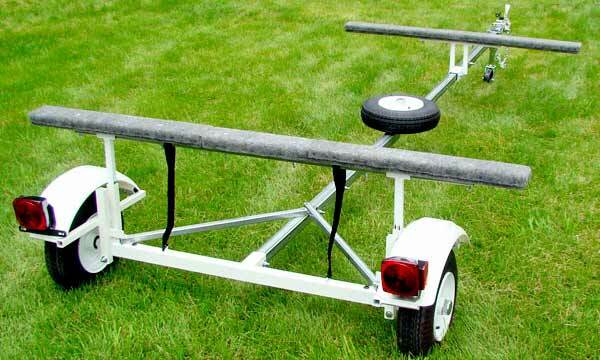 Portage Pal canoe trailers and kayak trailers are the best value for the lowest price, and they can be used as small boat trailers, watercraft trailers, and paddle board trailers. Two types of tow behind trailers, the T1000 single place canoe trailer and kayak trailer and the T2000 two place or three place canoe trailer / kayak trailer are available at Pelican Shops. These trailers are perfect for hauling all types of small watercraft and are manufactured from quality materials, built to last. The low bunk height makes it simple and effortless to load and unload your canoes and kayaks. The single-canoe or kayak version of the T-2000, the T-1000 is also an exceptional value. Designed to keep costs down, to provide a soft ride for your boat, and to be shipped easily. The T-1000 has proven durability. The standard trailer can carry canoes and kayaks up to 12' long and with the optional tongue extension it can carry boats from 8' to 19' long. The T-1000 ships via UPS in two boxes and can be assembled with household tools in 4 hours or less making these the most economical and versatile trailers on the market. CAN ALSO BE USED TO TRANSPORT MANY OTHER KINDS OF WATERCRAFT. OPTIONAL SPARE TIRE AND CARRIER. This trailer is an exceptional value. Designed to keep costs down, to provide a soft ride for your boats, and to be shipped easily, the T-2000 has proven durability and can carry 2 or more canoes or kayaks up to 12' long. With the optional tongue extension , it is capable of carrying boats from 8' up to 19' long. The T-2000 ships via UPS in two boxes and can be assembled with household tools in 4 hours or less making these the most economical and versatile trailers on the market.